"I am an office worker by day, and a freelance vigilante by night." Hey, everybody! You know what's up. Once again, it's time to meet the Angry Reader of the Week, spotlighting you, the very special readers of this website. Over the years, I've been able to connect with a lot of cool folks, and this is a way of showing some appreciation and attention to the people who help make this blog what it is. This week's Angry Reader is Betty Felon. My name is Betty Felon. Please don't sue me, Elvis Costello. I am a blogger, a designer, and a superheroic sartorialist. A Chinese hybrid between Batgirl and a magical girl. I'm currently residing in my secret headquarters. *in Animal Crossing: New Leaf. 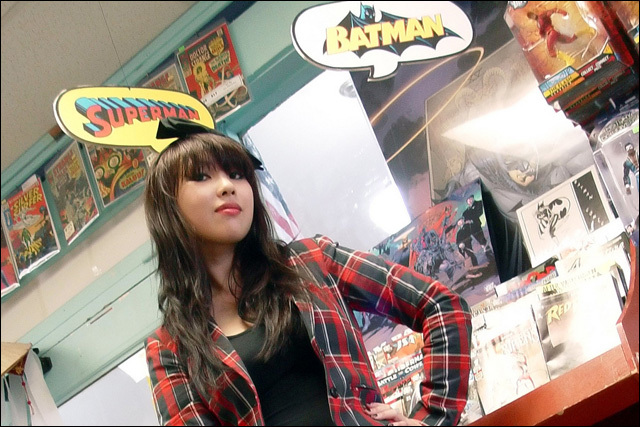 The three Bs: bows, Batman, boybands. But also these things too: karaoke, The Clash, snacks, feminism, cats, confrontation, and thick cat-eyed eyeliner. Microaggression, passive aggression, poor karaoke etiquette, cold french fries, problematic comics creators, institutional racism/sexism.